As Caesar marches on Rome and panic erupts in the city, Gordianus the Finder discovers, in his own home, the body of Pompey's favorite cousin. Before fleeing the city, Pompey exacts a terrible bargain from the finder of secrets-to unearth the killer, or sacrifice his own son-in-law to service in Pompey's legions, and certain death. Amid the city's sordid underbelly, Gordianus learns that the murdered man was a dangerous spy. Now, as he follows a trail of intrigue, betrayal, and ferocious battles on land and sea, the Finder is caught between the chaos of war and the terrible truth he must finally reveal. 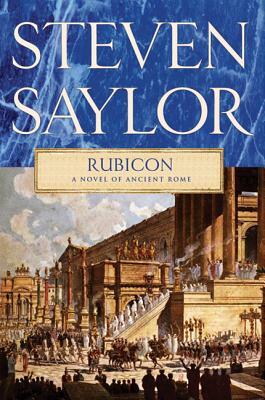 Rubicon, set in early days of the Roman Civil War, is a pivotal novel in Saylor's bestselling and critically acclaimed series of novels set in late Republican Rome.